In John Hall's previous career he was a technical writer and IT professional, creating manuals and training pieces and working on computers. 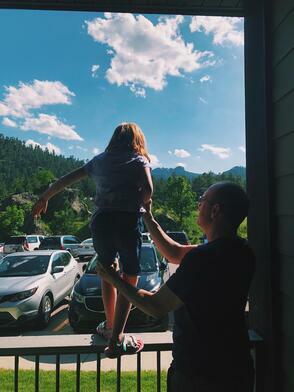 Now he controls his own schedule and has an ever-changing view through his "office" window. 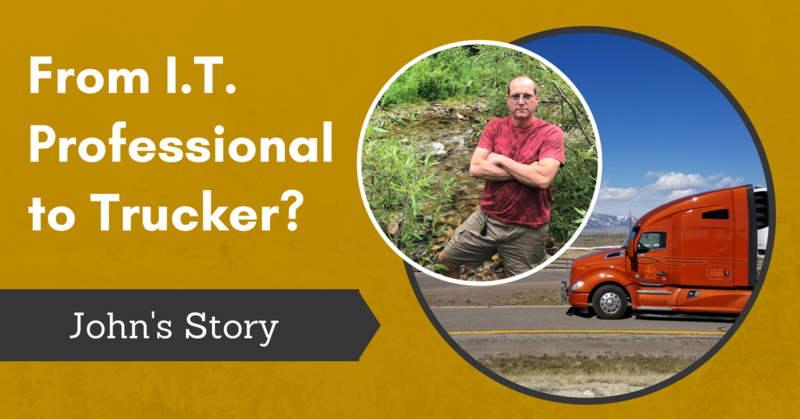 Curious how an IT guy embraced the trucking lifestyle? We asked John to tell us his story in his own words. Growing up, my hobby was always computers, so I naturally went into that field. I moved my way up the corporate ladder and worked in an office environment for over 20 years. But after awhile it got too confining for me. I found myself wanting a change. I have always enjoyed driving. In fact, I took many cross country trips to the mountains and even the Grand Canyon. But one humid, farm-country, July weekend, a neighbor friend of mine who drove OTR was having a cookout and after a few beers, I said to him, "If you asked me, I'd team drive with you and quit my job in a heartbeat!" About two weeks later, out of the blue, my friend brought the issue up again, "My boss said he'd hire you, and pay 1/2 your CDL." At that point I remembered my offer, and started looking up what a CDL was! After searching my way around the Internet, I found a company that said they would pay the full cost off my CDL if I stayed for a year. I applied, was accepted, and started studying. I studied and studied and repeatedly completed 10 variations of online pretests for each for the three required DOT knowledge tests. SUCCESS! WHEW! After orientation, I was handed keys to a Freightliner FLD and told "do your pre-trip". It was like jumping in a cold pool. You just do it. No time to think about how big or complex or anything else, just fall back on your training and take it slow, step by step. Well, it all went well and I stayed with the company two years. 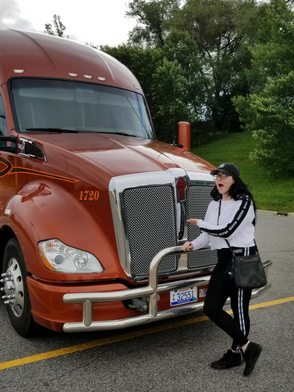 I was hooked and totally addicted to trucking! I ended up leaving the first company I worked with due to poorly maintained equipment. I was just having too many breakdowns on the road. They don't teach you about that in school, you just learn over time that some companies invest more in newer equipment. The saying if "The wheels ain't turnin', you ain't earnin" is so very true. So after spending a lonely Christmas in a hotel in SC, I decided to look around...ENTER K&J Trucking. Great story, great equipment. I am very happy with K&J. I am making two times what I was before, primarily because of increased miles, but better dispatch and a NASCAR-like shop environment are an amazing resource too. The staff at K&J have always been super proactive and efficient. It's amazing to me how some companies just don't invest in newer equipment, Nobody wins if your truck is in the shop, or your trailers don't have good doors, landing gear, lights, etc. My job is so much easier not having to constantly fix broken trailers by myself. I regret not getting into this industry earlier! It's a whole new world to learn. I have been to 45 states, and have begun to understand shipping/receiving and logistics like I never thought I would. The hidden world behind all the products we buy was revealed to me. I am a part if it and it makes me proud to be in the "Trucking Brotherhood". I have ZERO interest ever working in an office, ever again, unless its shaped like a Kenworth T680 and smells like diesel. Photo descriptions: John with his youngest daughter, Gracie; and John's eldest, Sophia with his truck. Are you ready to make the leap from corporate to freedom? We have a lot of options to get you started on the road, one even has guaranteed income!